If you’re like most of us, you wish you could take your calorie burn up a notch. You want to make your workouts work for you by working smarter, not harder. Whether your goal is to lose weight, have more energy, or simply feel better, here are six of our favorite ways to burn more calories and see faster results than you thought possible. If you work out once a day by going to a gym class or going on a run, you can’t just sit on the couch all day afterward and expect to see results. 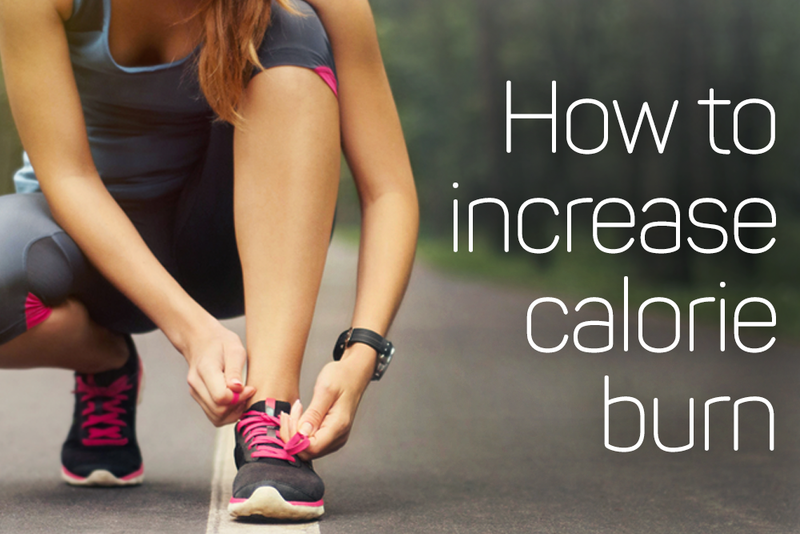 In order to maximize your calorie burn, you need to be active all day. Start the day off right by committing to moving right away in the morning, and set alarm reminders on your phone to get up and move more throughout the day. Choose to stand instead of sit if you have the option, take a walk on your lunch break – anything to add more movement throughout your day. If you have a desk job, consider a standing workstation. That’s what I did, and my Ergotron Workstation is helping me burn approx 200-300 extra calories a day, not to mention helping to reduce my back stiffness. People in constant motion burn more calories. Studies have shown fidgeters burn about 200 extra calories a day. So I’m serious when I say: Take the stairs and not the elevator, look for a parking spot close to the store and make a game out of it—see how much movement you can work into your day. Most days of the week you should be getting both programmed and spontaneous exercise. Consider your spontaneous exercise as all the extra motion we just talked about. Programmed exercise includes your scheduled workouts on your calendar each day. View your days as a blank slate opportunity to get both planned and random exercise. It will mean you are moving more and able to burn more calories. – And other foods referred to as metabolic machines, like oatmeal. Differences in what you eat after you exercise impact your metabolism. Some people call it the golden hour. The 60 minutes after you finish a workout is the perfect time to refuel with a combination of protein and carbs. You can recover with a protein shake—the perfect combination of carbs that are healthy (fruits!) and the protein your body needs. If you want to increase your calorie burn, work out like trainers do. Attend more than one workout class in a day, work out for more than one hour, or see if you can get more than the recommended 10,000 steps per day. Try for 15,000 or more. Get a combination of cardiovascular exercise and weight training. Eventually, you will increase the number of calories you burn while you are at rest too. Get your heart pumping with some of our cardio strength workouts! Don’t coast through your workouts. Coasting means you aren’t sweating, your brain isn’t focused on what your body is doing, and you aren’t putting everything you have into your workouts. If you have a choice in a class to do a high intensity move, take it! Remind yourself during exercise that this is your opportunity to burn more calories and push yourself. Don’t be on the elliptical flipping through a magazine and barely getting warm. If you want to burn calories you need to increase your exertion….that means getting mentally focused and increasing your heart rate. Music can help! Try some of these tips to get the most out of your fitness goals! Remember: YES YOU CAN!